Imagine the scene. Nintendo executives appear at Lady Gaga's house (would she have a house, or does she live in a sort of avant-garde butchers fridge?). 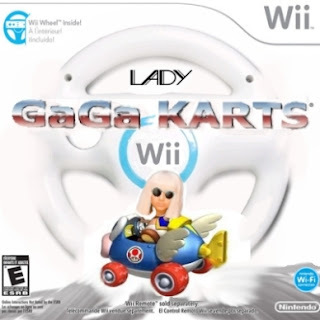 "Ms Gaga, we would like to offer you $10,000,000 to put your name to an unlikely Nintendo Wii game where players, playing as you, race rivals on go-carts to a studio and then sing several of your greatest hits. Interested?" This, or something very much like it, must have happened because we now have the Wii game which promises much (well, not that much) and delivers only adequately. You are Lady Gaga. You are in a race on the streets of New York. Your competitors are a number of real and imagined competitors of Lady Gaga. If they get to the studio first they will release the "new song" instead of you. Hurry, little girl, Ke$ha is gaining! The surreal action involves racing go-carts against the likes of Ke$ha, Christina Aguilera and Amy Winehouse. All of whom have a number of tricks up their sleeves, which readily appear in the race in order to force you off the road. The race itself is quite exciting and the Wii responds well to the wheel (included with some versions of the game). The bog standard rhythm based studio section isn't as exciting. Our advice - Lady Gaga, stick to 'singing'.